Kids’ Club is thrilled to continue its support of the Tarrytown School District’s AFHT Literacy Program for the 2017-18 school year. 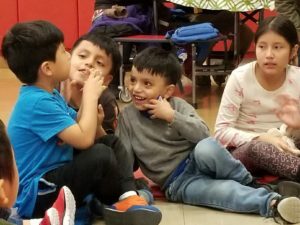 Running three nights per week, this program provides a community network of learning for 90 families and helps build pre-literacy skills in young children. Last week, the letter of the week was “w,” so “wind” was the theme. The children engaged in songs, stories, and hands-on activities to explore items the wind can move. They also made their own kites to bring home so they could continue having fun while exploring the power of the wind with their families.